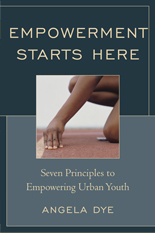 The scope of this book covers an experimental approach to social change within urban communities by way of seven distinct principles for student empowerment. Turning classroom methods (based on these seven principles) into a school model, Preparatory School for Global Leadership was the first school to experience student empowerment at a school-wide level. For individuals looking to increase the efficacy and achievement of at-risk learners, this book provides insight on how. Not only are instructional methodologies discussed, but stories are shared to help the reader gain a deeper understanding of the psychological, social and political challenges associated with real school reform. This initial chapter is personal in nature in that it profiles the author’s journey as an educator. By explaining her own experiences as an urban, at-risk youth to her successful work as an urban classroom teacher, the chapter describes the birth of a curriculum model (SBC) and a school (PSGL) that employed seven distinct principles of student empowerment. This chapter presents empowerment as a philosophy as well as an instructional framework. In addition, this chapter describes the phenomenon of learned helplessness and how empowerment directly combats it. Finally, the seven principles and tenets of empowerment (profiled in chapters 2 through 7) are introduced. This chapter profiles a specific way to connect urban, at-risk learners with project based learning. While most students suffering from learned helplessness are not able to work independently, PSGL’s programming truly built autonomy as well as global awareness among its students. This chapter examines service learning as a way to empower students. In it, the unique way power was shared and transferred to students is discussed. In addition, a rationale is provided in how this new approach to student relations (via student power) can serve as leverage to engage typically disenfranchised students into the learning process. Chapter 4 serves as a transitional chapter between progressive programming and traditional programming. In this chapter, the need for curricular supports is championed in order to enhance school-wide student achievement. This chapter looks at how to build basic skills as a foundational aspect of empowerment. This chapter outlines specific techniques used to teach student mastery and retention within core subjects such as reading, writing and math. This chapter digests how to measure growth and looks at the function of district tests in relation to empowerment. This chapter looks at the role of student accountability as it relates to their achievement and their empowerment. While behavior management is discussed, chapter eight makes a case for student accountability that extends beyond management. In it, there are specific methods for empowerment that center on students’ self-awareness and ownership of their choices. This chapter presents the behind the scenes work with empowerment. While most of the chapters deal with the principles and methods of empowerment, chapter 8 looks at the paradigms and social constructs of public education and social change (as it relates to empowerment). This chapter examines the results of empowerment as it relates to the scholarship, citizenship and personal ownership of students. In this chapter, quantitative data and qualitative experiences are presented that proves the impact that empowerment can have on student achievement. The book ends with an empowerment mandate to the reader. Click here if you want a consultant, trainer, or speaker for promoting the Empowerment Framework in your organization or for your constituents/stakeholders.